Monday, October 15, marks National Latinx HIV/AIDS Awareness Day (NLAAD) 2018. Spearheaded by the Latino Commission on AIDS and the Hispanic Federation, the event provides an opportunity to promote HIV testing, prevention and treatment and raise awareness of the epidemic in the Latino community. Latinx represent 18 percent of the U.S. population yet accounted for almost 1 in 4 (24 percent) infections among adults and adolescents in 2015. Factors such as lack of health insurance, language barriers, lack of familiarity with the U.S. health care system and stigma often limit the health care access of Latinx in the United States, thereby limiting opportunities for HIV/AIDS screening and treatment. Given that Latinx are the largest and fastest-growing minority group in the United States, addressing HIV/AIDS in their community is important to the nation’s health. “NLAAD continues to promote strategies to reduce stigma associated with HIV. This is key in addressing social and structural conditions that spur the disproportionate impact of the epidemic on Hispanic/Latinx communities,” said Guillermo Chacon, president of the Latino Commission on AIDS and founder of the Hispanic Health Network, in a press release about NLAAD and a related mobilization event on the steps of New York City’s City Hall. Today is National Latinx AIDS Awareness Day (#NLAAD). This year’s theme is #endinghiviseveryonesjob. Do your part by #gettingtested and by #endingthestigma! For more information, visit: bit.ly/NLAAD-info. 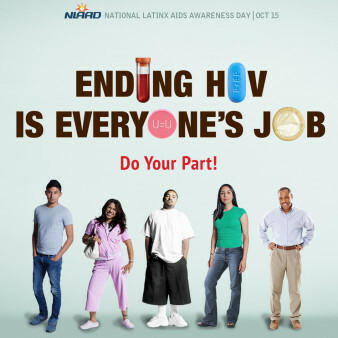 You can download NLAAD posters and social media campaigns from HIV.gov and NLAAD.org. In 2016, the word Latinx officially replaced Latino in NLAAD. Latinx (pronounced “la-teen-ex”) is a gender-neutral alternative to Latino and Latina.